Great handling from stadium official after Dedryck Boyata's wild attempt. 🙌 Check out the hands from the Celtic steward yesterday! 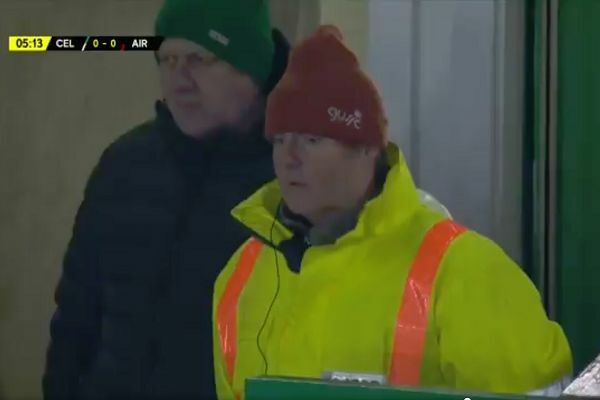 A steward standing high up in the stand behind one of the goals at Celtic managed to catch a shot from Dedryck Boyata that went wildly over the bar. The Scottish Premiership side played host to semi-professional League One Airdrieonians at Celtic Park on Saturday in a Scottish Cup fourth-round tie. Celtic defender Dedryck Boyata blazed an attempt at goal high and wide from outside the area early in the first half. It flew directly towards a steward standing by an entrance to one of the blocks in the stand. But the stadium official caught the ball cleanly and is complimented on his handling by the commentators. The home side came away with a 3-0 win that included a goal for George Weah’s son, Timothy, on his debut.